A couple of really interesting studies pitting a vitamin or nutrient supplement (vitamin C or fish oil) against a natural food source of that nutrient (oranges or salmon) showed that food came out way ahead of supplements in the body, even though the amount of the nutrient (fish oil or vitamin C) in the food vs. the supplement studied was the same! To me, this says that there is a lot about nutrition that we don’t know and that there are likely many components of food that provide benefits synergistically. The benefits of taking an isolated nutrient as a supplement pale in comparison to the power of eating a variety of real food. With that being said, I do take supplements, but only a few. Today I’m going to share which supplements I take for general wellness, which ones I don’t, and which specific foods I make a point of eating regularly instead of taking certain supplements. I want updates and freebies! 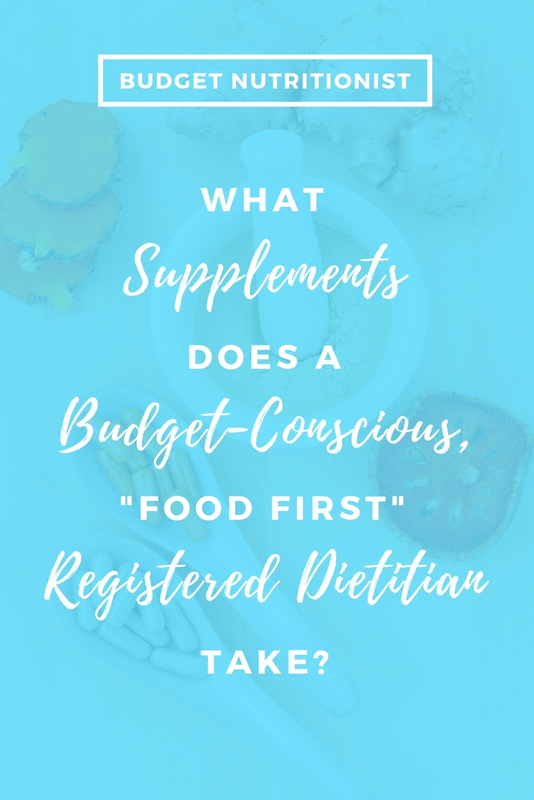 What Supplements does a “food first” Registered Dietitian Nutritionist take? The main supplement I take is a generic multivitamin tailored to my age and gender. I take Equate Women’s, which I buy at Walmart. This costs me roughly 5 cents a day. I’ve also taken Centrum Women’s and One A Day Women’s and I’d be perfectly happy taking Nature Made or the generic Target/Walmart version of any of these brands. What I wouldn’t do is buy a fancy, designer multivitamin online or at a special vitamin store. I believe that this is a waste of money. I don’t take chewable or gummy vitamins, because although on first glance they look equal to multivitamins in capsule form, the nutrient content is almost always much lower. Gummies and other chewables typically contain fewer types of vitamins and minerals and lower amounts of the ones they do contain. A multivitamin fills small gaps in my diet to help potentially prevent outright deficiencies, which are no fun for anyone. I consider a multivitamin to be optional for most people, but there are a few circumstances where I personally feel that they are absolutely necessary. Most people living in the Midwestern states in the USA (including me!) are going to be either on the very low end of the optimal range for blood levels of vitamin D (30-80 ng/ml) or deficient. The reason for this is that we produce most of our vitamin D in response to sunlight exposure. We actually don’t get very much vitamin D from food! Sunlight hits our skin, triggering production of vitamin D, which is then converted in the kidneys and liver into a usable form for the body. Without adequate sunlight, this simply doesn’t happen! What is “adequate sunlight”, you ask? 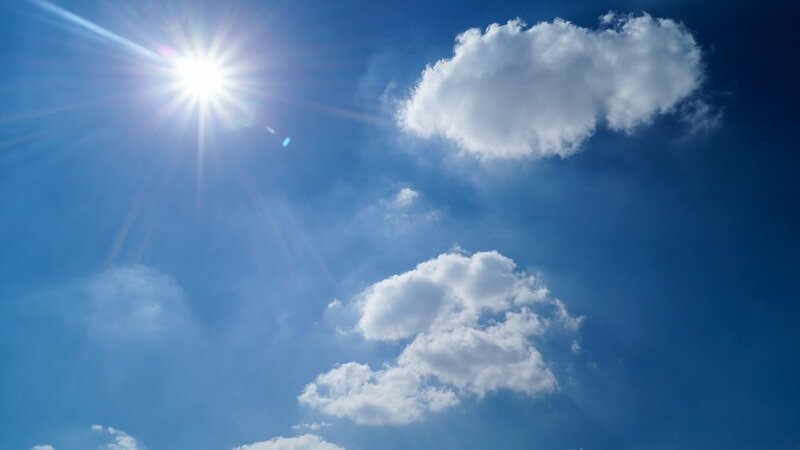 Around 10 minutes in the sun a few days per week between the hours of 10 AM and 2 PM on sunny or mostly-sunny days in the warmer months will cause most people to produce all the vitamin D they need! You can probably see the issue with this. First, many of us are working inside during those hours - even in the warmer months. Second, a lot of us wear sunscreen whenever we are exposed to sunlight, because who wants skin cancer, right?? Unfortunately, this can lead to minimal or no vitamin D production. Third, there are only about 6 months of the year (at least in Kansas City, where I live) that I would call “warmer months”. In some parts of the world, there are even fewer months of adequate sun. Bless you people who live in cold places! There’s a really nifty cell phone app (at least for Android phones) called QSun that tells you - based on your skin tone, location, and the UV index for that day - how long you can be in the sun before you will start to burn. This is ideal because burns are No Bueno and do indeed lead to skin cancer. No, thanks! The idea is to get enough sunlight to trigger sufficient vitamin D production by the skin (remember, around 10 minutes of exposure at the right time of day and year is typically all it takes), but not enough to cause sunburns. Too much of a good thing is not a good thing! 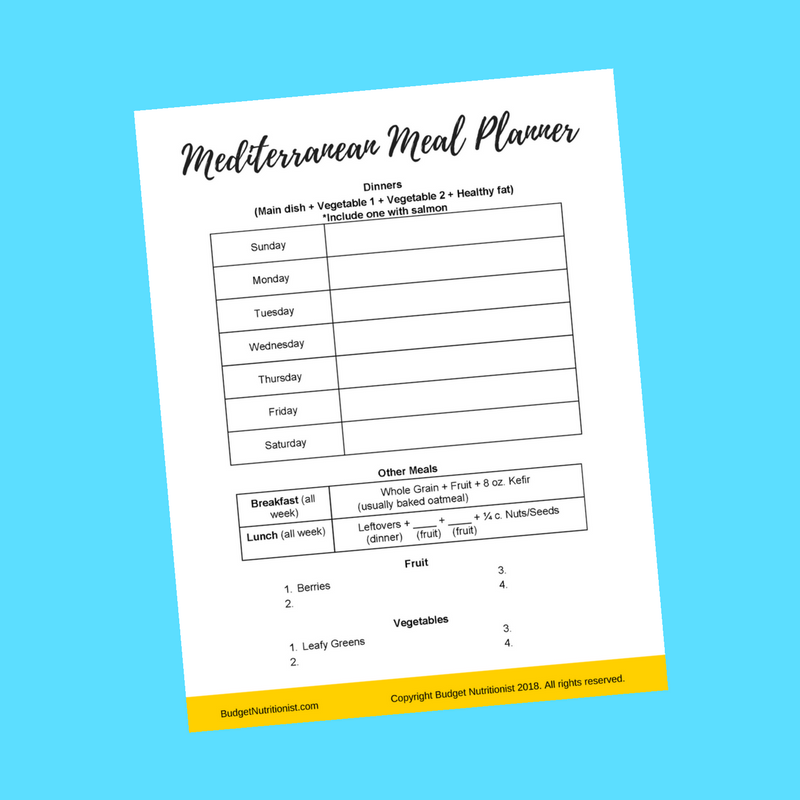 The Mediterranean Diet, which I follow as a long-term lifestyle for wellness (not a gimmicky way to lose weight), emphasizes consuming fish on a regular basis. Specifically, it emphasizes eating fish high in omega 3 fatty acids - particularly long-chain omega 3’s, of which two key players are DHA and EPA. Omega 3 fats (especially EPA and DHA) are key for optimizing brain health, heart health, and overall inflammation levels in the body. 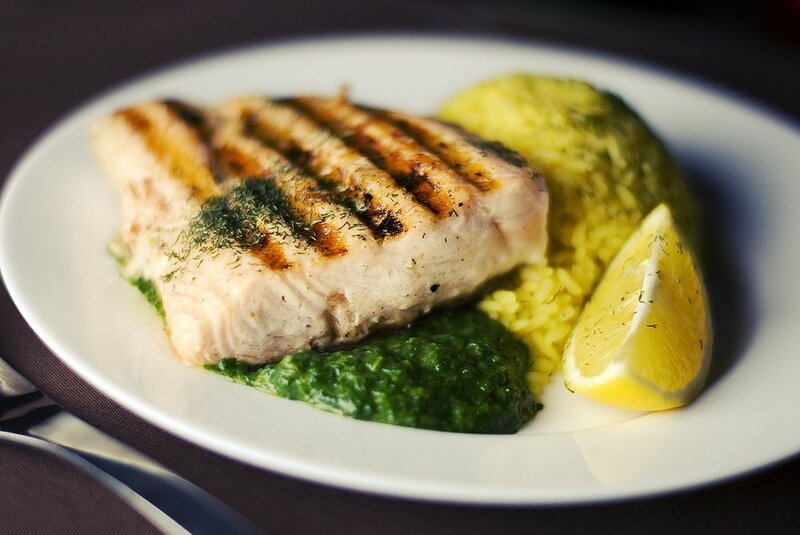 All it takes is two 3-4-ounce servings of oily fish per week to get all of the omega 3 fats the average person needs. My go-to strategy is to have oily fish for dinner one night and make enough for leftovers for lunch the next day. Other types of fish, such as cod, tilapia, shrimp, crab, and oysters, are not very high in omega 3 fats. These kinds of fish are still encouraged as healthy protein options on the Mediterranean diet (assuming they’re not fried), but they won’t really meet our needs for omega 3’s. There are a few circumstances in which taking a fish oil supplement (in addition to eating oily fish twice per week) may be helpful, such as for someone with high triglyceride levels. For general health, however, I feel that I’m better off just eating salmon and tuna. The problem with probiotic supplements is that they are an encapsulated form of living organisms (probiotics) outside of their natural habitat. As a result, they may or may not be alive by the time you consume them. On top of that, they’re pretty pricey. Even drugstore generic brands of probiotics can cost upwards of $1 a day! On the other hand, there is a growing body of research that probiotic bacteria may be really good for us to consume on a regular basis. So what’s a budget-savvy consumer to do? I drink kefir or eat yogurt several days a week. I describe kefir as the tangier, more hip, and drinkable cousin to yogurt. It has a slight edge over most yogurts from a probiotic standpoint because it usually has a larger variety of strains (types) of probiotic bacteria. This is a significant plus because the strain that benefits one person may not benefit another person in the same way. We’re all different, and our bodies may benefit from different types of probiotic bacteria. That’s why variety is good. One of a few specific circumstances in which I do often recommend probiotic supplements in addition to probiotic foods is when someone has had C. difficile colitis. This is a really nasty intestinal bug that likes to come back again and again to haunt people. :( Probiotic supplements have been shown in some studies to help prevent this recurrence. An added benefit of consuming probiotics in kefir or yogurt - rather than in supplements - is that we get calcium, protein, magnesium, B vitamins, zinc, and potassium from these foods as well! That’s a lot of bang for your buck! Speaking of calcium, this is another nutrient I get from food instead of taking a supplement. I eat cheese in or on a lot of my food, have yogurt or kefir with breakfast several days a week, and drink milk in my coffee nearly every day. As a result, I get at least two servings of dairy on most days, which I consider to be sufficient. The old “3-A-Day” dairy recommendation is actually not supported by the Harvard Nutrition Department, which I highly respect and does not accept money from the dairy industry that I’m aware of, unlike the USDA. There’s some interesting research to suggest that fermented dairy (a.k.a. cheese, yogurt, kefir, etc.) may be significantly better for our bones than non-fermented dairy (aka milk, ice cream, butter, cream). This is still being studied and debated, but the research I’ve come across so far is enough to convince me for now to not drink milk as a beverage of choice (other than having it in my daily cup of coffee) even though it’s my favorite beverage. I do usually recommend calcium supplements when people don’t eat dairy products on a regular basis, either due to taste preference, ethical reasons, milk allergy, or lactose intolerance. By the way, lactose is the natural sugar primarily found in liquid or ”spoonable” dairy products that are not fermented (milk and ice cream are the biggest sources). This means that cheese, yogurt, and kefir are actually quite low in lactose and are usually extremely well-tolerated if lactose is the main issue. Plant sources of calcium do exist, but they contain other components called phytates and oxalates that bind with the calcium and prevent it from being absorbed by the body. This is why I don’t consider broccoli, kale, or spinach to be good sources of calcium. Another time I would consider recommending calcium supplements is when someone has a family history of osteoporosis. A lack of calcium in the diet is rarely the root cause of osteoporosis (typically, low estrogen or malabsorption is the cause), but calcium supplements may still be beneficial. Beyond these basic supplements and overall balanced diet, I do take a couple of specific supplements for a health condition I have, but these are not supplements that I feel are beneficial for general health. If you want to know what supplements to take for your personal health conditions beyond promoting general wellness, I highly recommend setting up an appointment with a registered dietitian nutritionist (RD/RDN) who is specialized in an area related to your specific medical condition. Now I want to hear from you in the comments! What do you think about supplements? Do you agree with my “food first” philosophy?